When seeking to free up space on a crowded pedalboard, whether to alleviate an uncontrolled population explosion, or (more likely) to make room for a new pedal acquisition, it's natural to look to the biggest, most egregious real estate hogs first. On many pedalboards, the biggest hog in the pen is the wah pedal. For some reason, wah pedals have evolved somewhat more slowly than the rest of the effects pedal world, where drastically shrinking enclosures, enhanced ergonomics, true bypass switching and standardized power have been the order of the day for some time now. In contrast, the wah pedal remained largely unchanged for decades, with the standard Vox and Cry Baby models dominating the market for decades. Innovative designs popped up here and there over the years, but few garnered much attention among serious guitarists, for a variety of reasons. Things are changing, however, and more stompbox designers have begun to pay attention to that big, black, foot-sized hunk of metal that's been taking up more than its fair share of pedalboard space for far too long. Recent years have seen an influx of miniature sized wahs, some no bigger than a standard issue Boss pedal that not only do the classic wah-wah tones, but have a bunch of other useful functions and features as well. I have collected a handful of the best tiny wah-wahs, and I present them to you now. It's about time, Dunlop. The new Dunlop CBM95 Cry Baby Mini wah looks just like its iconic, full-sized predecessor, only miraculously shrunk to half the size (which I must admit, is disconcerting at first glance, as if someone has played a practical joke of some kind.) Once the Cry Baby Mini is under foot, however, it feels totally natural. None of the classic Cry Baby sweep or feel is lost, which probably indicates that Dunlop put substantial effort into making sure nothing would be compromised in the miniaturization process. The CBM95 has more than compactness going for it, though. It also features three distinct voicings, including Low, Vintage, and GCB95, true bypass switching, standard nine-volt power capabilities, and a Fasel inductor, which gives it a leg up over the original Cry Baby, as well as many other old-school wah designs that haven't evolved since Hendrix's day. I especially like its "Low" setting, which gets nice and pukey with fuzz. And hey, the Cry Baby Mini is only 99 bucks. I predict that these are going to sell like the hot cakes! AMT Electronics has a reputation for innovative, feature-packed products, including amplifiers, effects pedals, and a spectacular line of tube guitar preamps, so it's no surprise that its compact, purple wah pedal ain't no slouch either. Why is it called "Japanese Girl?" I dare not speculate, but regardless of the name, it's a great wah that should send your current squawking box o' potentiometers packing. As a matter of fact, this Japanese Girl doesn't even have a potentiometer because the circuit is based on an optical sensor design. This means no scratchy pots, fewer moving parts, and thus, less maintenance than a regular old wah-wah. It sports three selectable frequency ranges, for a wide variety of tones that range from classic to modern, true bypass switching, status LED's, standard nine-volt power, and an adjustable treadle. I like that it will stay in place even if you take your foot off of it, which is handy for those of us that like to do the ol' cocked-wah tone filter maneuver. At around 130 dollars new, the AMT WH-1 Japanese Girl is very reasonably priced. The Chi-Wah-Wah might be the smallest of the small wahs. It's roughly the size of a Boss pedal, and comes housed in a bombproof rolled steel enclosure that should last for eternity, maybe longer. It's an optical actuation design, so there's no switch, it just start's wah-wah-ing when you press down on the treadle. This is a clever arrangement which eliminates the inevitable switch-related maintenance issues, but it might take a bit of getting used to for some guitarists. You press down with the toe of your shoe to make the wah action, which will seem quite unnatural to lifelong players of the Cry Baby or Vox wahs. Once you get properly oriented, however, the Chi-Wah-Wah's many charms become obvious. Its action is buttery, and its tones are splendid. There are knobs right on top for Level, Contour, and Gain, which allow for very musical tone shaping, whether you're looking for something thick and raunchy, bright and quacky, or somewhere between the two. 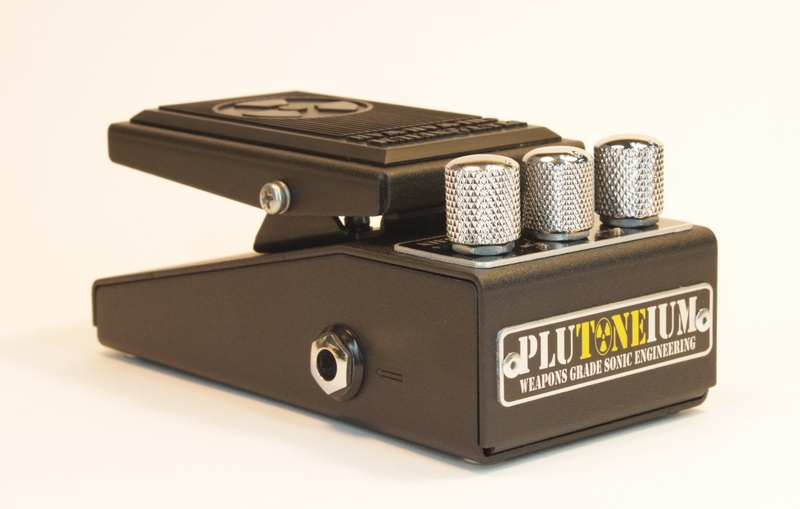 The only real downside to the Plutoneium Chi-Wah-Wah is that, because of its spring-loaded treadle that returns to bypass mode when you lift your foot off, it can't be set for a cocked-wah tone. This is a relatively minor negative, though, and probably won't outweigh the many positives of the Chi-Wah-Wah for players in search of the ultimate compact wah pedal. Hotone specializes in miniature guitar amps and effects, and the company's Soul Press wah-volume-expression pedal is truly a tiny powerhouse of functionality. With three modes, it can perform a number of duties admirably, all while taking up very little space on a pedalboard. The wah mode is voiced to sound like a classic Cry Baby, with plenty of quack and the signature Cry Baby frequency sweep, while the volume mode uses an active circuit to eliminate the tone dulling impedance issues that plague so many passive volume pedals. The expression mode can be used without external power or battery, and is widely compatible with most pedals, as well as synths and other instruments that make use of expression pedals. The Hotone Soul Press is a multitasking master for the player that needs one small pedal to do a lot of different jobs. It's equipped with true bypass switching, comes in a fetching red enclosure, and sells for around 100 bucks American. This fine vintage piece from America's own DOD is one of the most dramatic early departures from the norm in the wah pedal world, and as far as I know, the first compact wah ever made. Manufactured from 1987 to roughly 2000, the FX-17 used a curious variable capacitance circuit to make the wah-wah sounds, as opposed to the more common potentiometers and inductors. It can function as a wah, volume pedal, or voltage control pedal for synthesizers, and is engaged with a switch in the heel position of the treadle, opposite of the standard toe switch of a “Baby-style” unit. The sound of the FX-17 is unique as well, with a modern, full-range sweep that was a world away from a stock wah-wah. I have always liked it for the deep, guttural burp in the lower end of its range, which sounds remarkably cool when paired with a thick fuzz tone. Downsides include a rather narrow travel of the treadle, which can make it a little tricky to control, and its enclosure, which is pretty damned ugly. Upsides include awesomeness, ruggedness, and cheapness. The FX-17 is common on the used market, oftentimes for very miniature amounts of money. I believe I paid about 30 bucks for mine. Get one! I sense that the era of the mini-wah is just beginning. Especially with Dunlop getting in the game with the Cry Baby Mini, I can only imagine that every other wah manufacturer will soon follow suit with a flurry of similarly compact designs. This is a very good thing that's been a long time coming, and should provide some relief for guitarists the world over that have long been suffering from painful cases of pedalboard bloat.